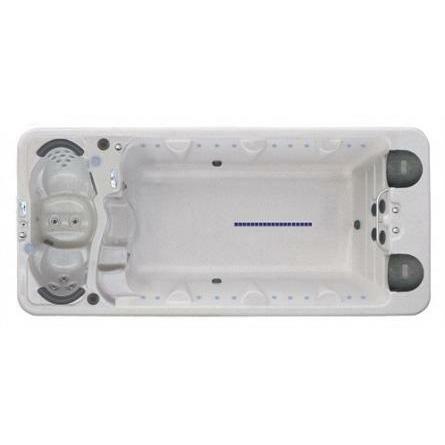 The Vita Xstream Duo Pro combines the hydrotherapy benefits of a hot tub with the health benefits of swimming. This fantastic hot tub swim spa provides great value for money if you need to exercise through swimming for general fitness or training in your own home environment. In this swim spa, you swim against a current generated by four 7bhp pumps creating a variable current against which to swim in your chosen stroke. This is not just a swim spa, you also have a two seater hot tub withits own temperature setting so if you are watching someone else swim or relaxing after your own swim, you can increase the temperature and benefit fromthe hydrotherapy jets. The best selling swim spa, you also have a range of other features from the efficient water management system with dual cartridge filtration to an optional music ssystem and a controlable heating system. There is a lower back therapy seat, perfect for improving reconvery times from exercise or injury along side hydro massage jets. If you need a swim spa to improve your general level of fitness or for training, the Xstream Duo Pro is a great entry level flagship model that wont break the bank and available from Bay Spas in Devon and Cornwall.